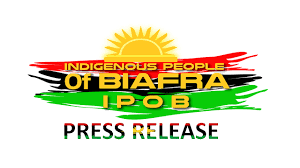 I wish that most Nigerians - especially the ignorant ones - those asking why the Igbos want Biafra, the stupid Igbo politicians, confused Niger Deltans, Yoruba cowards, and parasitic Hausa-Fulani will read this press release and listen to what Buhari said. He wants freedom for Muslims but he does not want freedom for Biafrans who are Christians and Jewish. What a hypocrite this Buhari and most Nigerians are.